What a thrill it is to be back in Wyoming! I arrived in Laramie two weeks ago, shyly crept my Connecticut license plates onto a side street, and dashed off into the field—that is, the sagebrush steppe of southwest Wyoming. Three hours west of Laramie, we turned off the interstate onto highway 191 north. When we reached the top of the bluff towering over Rock Springs, I was greeted by a familiar sea of sagebrush–quietly filling the landscape all the way to the edge of my view. Big sagebrush (Artemisia tridentata) is widespread across the temperate drylands of the United States where summertime dry air and high temperatures impose an insatiable demand for water on the landscape. Most rain events are small and merely wet the soil surface before being snatched back by the thirsty air. It is only during the cold season that the atmosphere eases its grip on the sagebrush steppe, allowing water to enter the soil and descend to depths where it is no longer at risk of evaporation. The result is that—regardless of what monthly precipitation data may suggest–the cold season is the wet season where it counts: in the soil! Big sagebrush extends stout roots beyond the reach of neighboring grasses and flowers to reach water stored at depth during the cold season. Shallow-rooted plants in the sagebrush steppe run a desperate race against summertime heat, scrambling to grow and bloom during the short window after snowmelt and before the precious shallow soil water runs out. Meanwhile, sagebrush sedately redirects its attention to deep soil water, sheds some ephemeral leaves to reduce the risk of dehydration, and proudly announces itself in the Fall by brightening the landscape as it unfurls hundreds of tiny yellow flowers. North of Rock Springs, as the highway approaches Farson, the sagebrush is broken by a series of shallow lowlands where nearly every sagebrush plant is dead. The highway crosses the eastern edge of a large-scale big sagebrush die-off that was first reported in 2014. The die-off is most severe west of 191 near the Fontenelle Dam along Eighteen Mile Road, where sagebrush mortality is widespread across upland and lowland landscape positions. Towards the edges of the sagebrush die-off—such as along highway 191 south of Farson–the mortality is restricted to lowland positions. The average annual precipitation around the Fontenelle Reservoir is about 7 inches (for perspective, the average annual precipitation of New Haven is about 47 inches!) and in 2012, much of the area received less than half that amount. The following year (2013) remained relatively dry until September, when precipitation equal to half the mean annual precipitation fell during one month. Local land managers reported standing water in lowland positions and the following spring (2014) they began to notice widespread sagebrush mortality. Was the drought in 2012 so severe that sagebrush died of thirst during the summer of 2013? Or, did they suffocate in the saturated soil in September of that year? (Low soil-oxygen and saturated soils can cause sagebrush to die within two weeks). Last summer, I collected vegetation and soils data at 95 plots within and around the sagebrush die-off. 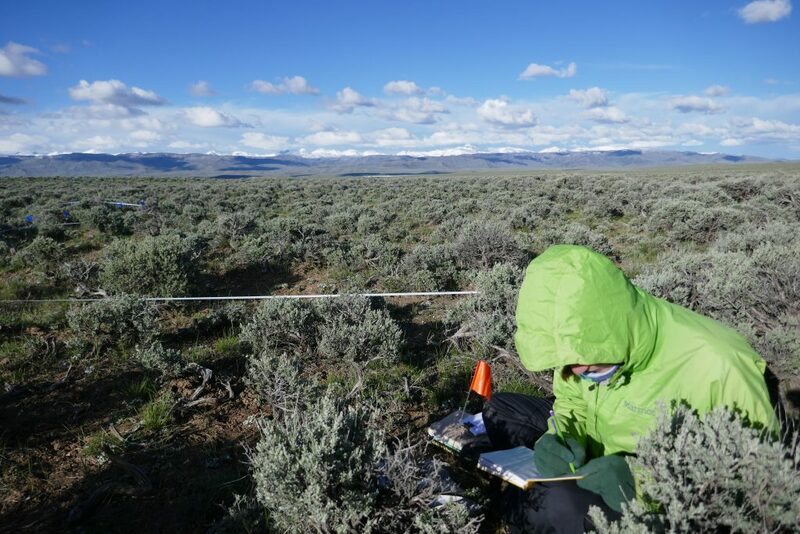 This summer, I will use these data in combination with past weather data and a soil-water model to investigate the role of the drought and flooding events in the sagebrush die-off. But first, I am running my own race against the summer drought—hoping to keep pace with the flowers and grasses—working as the field botanist for a study on the impact of livestock grazing on plant diversity around stock tanks. 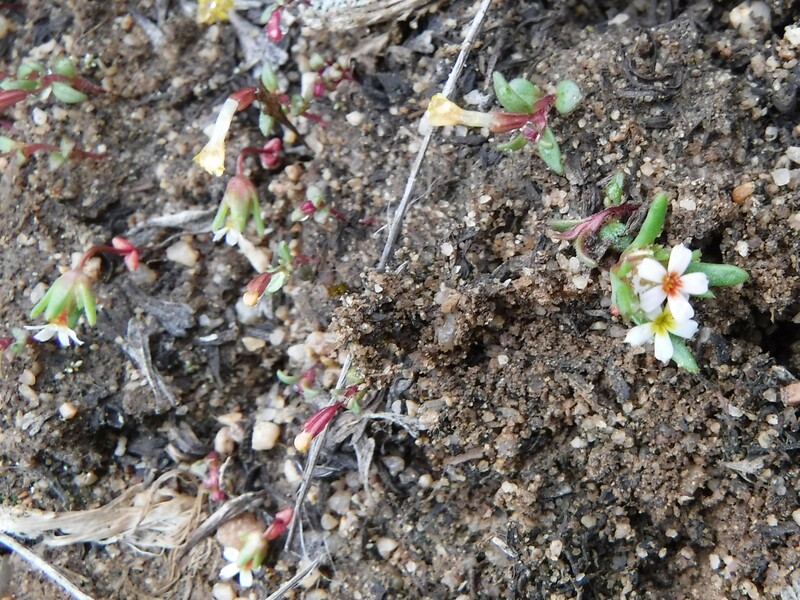 For now, I think we’re winning—on May 17, I finally met two tiny annuals (Mimulus suksdorfii and Gymnosteris parvula) at 7,200 feet that I had heretofore only seen as little brown skeletons later in the season. The next morning, I awoke at 5:30 am to the sound of snow falling on my tent. By the time we had packed up camp, the ground (and all the plants I had admired the day before) were hidden beneath a layer of snow. We drove back to Rock Springs only to discover that the storm had closed Interstate 80. Two days later, the roads cleared and we finally made it back to Laramie. 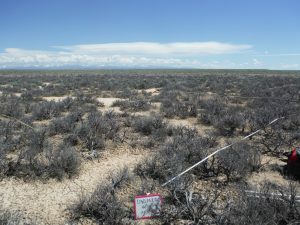 When we returned to the site on May 22, the snow had melted and the flowers were still blooming beneath the sagebrush. Close-up of Mimulus suksdorfii captured just before the blizzard! 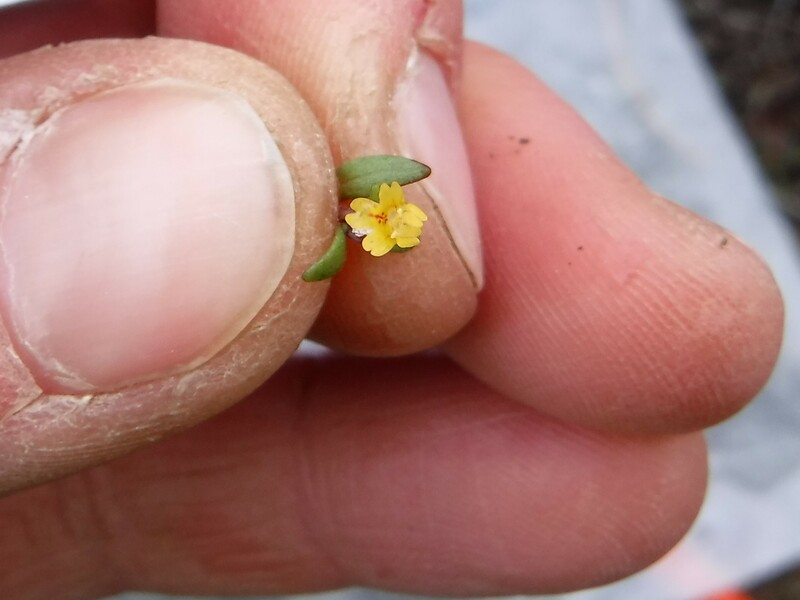 Gymnosteris parvula with Mimulus suksdorfii in the background – newly observed annuals!